Wednesday the 10th. What's for Dinner? I just baked two pounds of bacon so I could have bacon on my cheeseburger tonight. 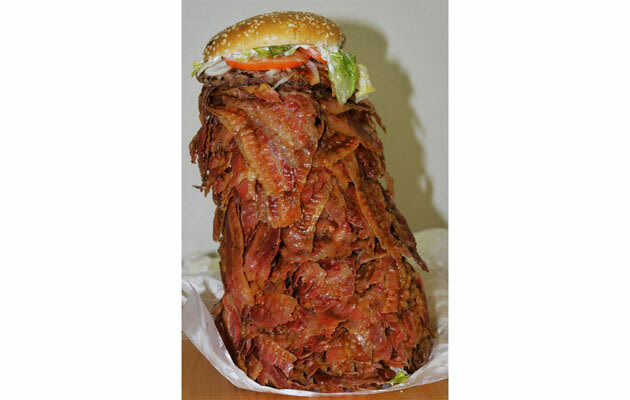 A little cheese burger with your bacon there Andy? We are having crab and corn chowder with what crab was leftover from last night. I haven't a clue. My taste buds are all over the place tonight: Italian? Breakfast? Grilled? Might end up with BLTs. Worked lates tonight so had left over Turkish style baked mullet. Lives of great men all remind us we may make our life sublime. We polished off the last of the mushroom soup, along with some cheese and crackers. Zucchini and black bean tacos and bloody Mary martinis. Hankering for an old "go-to" fave. Italian sausage carbonara.. I never put lettuce on my burgers. Also, kinda light on the bacon. Rock, I really like that burger. Ended up with salad and ravioli lasagna. I thought I had small, square raviolis. I had big, round ones. I used too much sauce. I added sausage disks that I should have cut smaller. Meh. It was good enough, but I think I'll stick to making authentic lasagna from now on. Or maybe I'll try it with small, square ones again.